There is an unfair, negative stereotype against motorcyclists. Motorcycle riders are often falsely depicted as outlaws or thrill seekers who speed, drive recklessly, disobey traffic laws, and invite injury by not taking proper safety precautions, such as wearing a helmet. The truth of the matter is, most drivers have nearly hit motorcyclists in the past, and are unwilling to acknowledge their own mistakes. As a consequence, they collectively shift the blame to motorcycle riders. Ashton & Price is keenly aware of this prejudice against motorcycle owners. This is why we are longtime members of California ABATE, a motorcycle organization dedicated to protecting and promoting the interests of the motorcycle community. Through ABATE, Ashton & Price pushes for improved legal and safety protections for motorcycle riders, as well as continuing rider and driver education. 80 percent of crashes involving motorcycles result in injury or death. If you have been injured in a motorcycle accident, you face a difficult, uphill battle with insurance companies, even your own. But we’re on your side. There are more than one million licensed motorcycle riders in the state of California, and they deserve the same legal protections that every driver on the road enjoys. Since our practice opened in 1996, we have worked tirelessly to help hundreds of motorcycle riders obtain the fair compensation they deserve for damages caused by negligent car and truck drivers. The comparative negligence law: In California, you can recover damages for a motorcycle accident, even if you were partially to blame. For example, if you were 40% at fault, you can recover up to 60% of your total claims and damages. The California motorcycle helmet law: In California, motorcycle riders are required to wear helmets. If you weren’t wearing a helmet at the time of your accident, your compensation could be reduced. Daytime use of headlights: All motorcycles manufactured after 1978 are required to use their headlights at all times, including during the day. Not having your headlights on at the time of an accident could result in the reduction of your claims. The use of earphones while driving: In California, all drivers, including motorcycle riders, may only wear a single headphone (such as helmet speakers) while on the road. 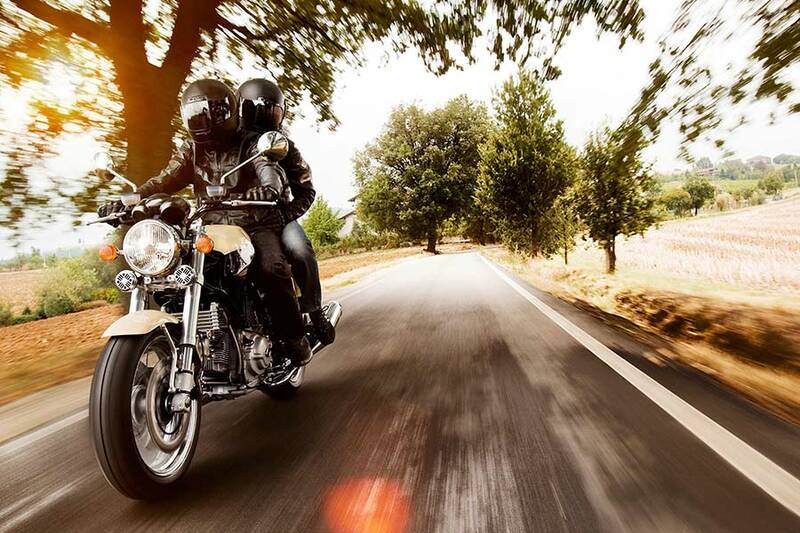 Wearing a full set of headphones while riding a motorcycle at the time of an accident may be deemed to be a case of distracted driving, resulting in a reduction in claims. Lane-splitting: In California, motorcycle riders are legally allowed to share lanes with other vehicles, ride their bikes between lanes of traffic, and to ride two-abreast in a single lane, as long as it is done safely and prudently. It is illegal for motorists to use their cars or vehicle doors to intentionally block or impede a motorcyclist’s movement on the road.